This whole thing sounds like something straight out of CSI: Cyber with references to Drones, Tor, remailers, anonymous image sharing and the scrubbing of meta data. Pretty interesting reading, although it rather smells like a lot of exageration. A super high-tech kidnapping – gone wrong in the end. Whoever wrote tho e-mails sent to the police (be it Matther Muller or not) was smart and plugged in, with references to the Egotistical Giraffe exploit and onions within onions. The press called it the “Gone Girl” kidnapping. But the bizarre story of a former Marine and Harvard-trained lawyer who allegedly masterminded the abduction of a California woman is notable for more than the twists and misdirections that made it fodder for CNN. 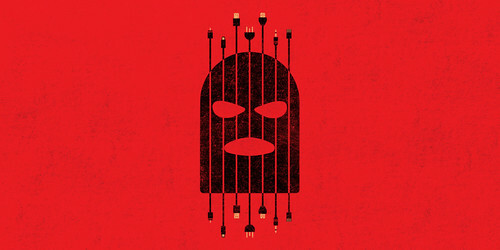 It’s a rare kidnapping-for-ransom scheme that availed itself fully of the riches of the Internet age, providing a glimpse of a future where brutal, physical crime and its digital analog merge into one. FBI court filings unsealed last week showed how Denise Huskins’ kidnappers used anonymous remailers, image sharing sites, Tor, and other people’s Wi-Fi to communicate with the police and the media, scrupulously scrubbing meta data from photos before sending. They tried to use computer spyware and a DropCam to monitor the aftermath of the abduction and had a Parrot radio-controlled drone standing by to pick up the ransom by remote control. All the high-tech theatrics may be part of why the police concluded that the whole thing was a hoax, until the FBI linked the abduction to a former attorney who once made the Journal of the American Bar Association‘s list of “techiest lawyers” for his computer skills. It makes for really good reading, and it really goes to show..truth really is often stranger than fiction. The irony is, he was tripped up by technology..and really simple technology. The Target POS system + CCTV was enough to foil him, plus the fact he used a burner phone at home? (not smart AT ALL). Why didn’t he just pay some kid $5 to go into the store and buy the phone for him? It’s unclear how much of the elaborate backstory in last March’s anonymous emails is reality, and how much is fantasy. The FBI affidavit notes that many of the incidents of burglary, theft, and vandalism described in the messages align with actual incidents reported to the police. But the bureau also notes that the same incidents were described in postings to the Mare Island section of the community news site NextDoor. It’s possible that the author of the email assembled his story Usual Suspects-style from NextDoor bulletin board postings. Perhaps the biggest unanswered question is whether Muller’s accomplices, mentioned at such length in the anonymous emails, really exist. In the Dublin attack, Muller is believed to have acted alone. But in the Mare Island kidnapping, both Quinn and Huskins told the police they heard multiple kidnappers talking among themselves. And in the 2009 case, the victim counted two perpetrators. “The victim reported to us that she had seen only one suspect, but she believed that she had heard a voice of a second male suspect,” says Lt. Zach Perron, a spokesman for the Palo Alto Police Department. So, did he really have accomplices? Do the FBI know more than they are letting on? Or was the illusion of accomplices another creation of Mullers twisted mind, perhaps he played back audio of muffled conversations to make the victims think there were multiple assailants. Who knows? I’m not sure if anything more will come out of this story – but nevertheless it’s an interesting one. Mimikatz is a tool to gather Windows credentials, basically a swiss-army knife of Windows credential gathering that bundles together many of the most useful tasks that you would perform on a Windows machine you have SYSTEM privileges on. It supports both Windows 32-bit and 64-bit and allows you to gather various credential types. Many people refer to it as a post-exploitation tool, something you would use to take a stronger hold of a network already compromised. It carries out techniques such as Pass the Hash, Pass the Ticket, Over-Pass The Hash (AKA Pass the Key), Kerberos Golden Ticket, Kerberos Silver Ticket, Pass the Cache & Attacking the Kerberos Session Ticket (TGS). Export certificates and keys (even those not normally exportable). The primary command components are sekurlsa, kerberos, crypto, vault, and lsadump. Sekurlsa interacts with the LSASS process in memory to gather credential data and provides enhanced capability over kerberos. Crypto enables export of certificates on the system that are not marked exportable since it bypasses the standard export process. Vault enables dumping data from the Windows vault. Lsadump enables dumping credential data from the Security Account Manager (SAM) database which contains the NTLM (sometimes LM hash) and supports online and offline mode as well as dumping credential data from the LSASS process in memory. Lsadump can also be used to dump cached credentials. In a Windows domain, credentials are cached (up to 10) in case a Domain Controller is unavailable for authentication. However, these credentials are stored on the computer. So yah, the big news this week everyone is shouting about is about the Fiat Chrysler Automobiles (FCA) owned Jeep Hack involving the new Cherokee which has remote control software which allows access to the engine, aircon, audio system and brakes – basically the whole car can be controlled remotely as long as you know the IP Address. The Wired article is a good read with some details about how the exploit hops between systems and how it was developed. It also highlights just how dangerous this can be as cars get more and more connected. Anyone driving about in a new Jeep Cherokee should update its software: at the moment the car’s brakes and engine can be remotely controlled by anyone with an internet connection. At next month’s Black Hat hacking conference in Las Vegas, Charlie Miller and Chris Valasek – a duo who have hacked more cars than Mad Max – will show off an attack on a Jeep Cherokee that enables the remote control of the car’s engine, brakes, and minor systems from miles away simply by knowing the car’s public IP address. 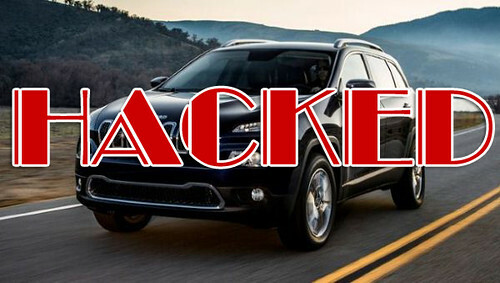 The full details of the hack are still private, but it relies on the uConnect cellular network; since 2009, Chrysler cars have included hardware to connect to this network to reach the internet. The two researchers have demonstrated that a canny hacker can use the uConnect system to get wireless access to major components of a car’s controls, and potentially physically crash it remotely with no one being any the wiser. The flaw has existed in the system since 2013. This is the first time a car hack has gone fully wireless though and it works over the Internet, which makes it really scary for owners of the effected vehicles. I’d imagine other cars with similar features might be equally vulnerable too, just that no-one is focusing on them yet. Or people are, but it’s in the underground – that’s impossible to know. It’s an ugly part of the car industry though, car experts developing software and operating systems with old outdated technology and models when they could just adopt peer reviewed operating systems and software. I for one welcome our Android Auto overlords. Miller says the hack will work on recent Fiat Chrysler motors – such as Ram, Durango, and Jeep models. The pair disclosed the flaws to the manufacturer so that a patch could be prepared and distributed before their Black Hat tell-all. The fix is supposed to stop miscreants from accessing critical systems via the cellular network, a protection mechanism you would have expected in place on day one, week one. 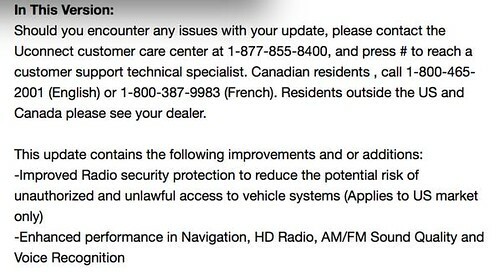 In short, make sure your car’s software is up to date; check your manual for details on obtaining the latest firmware. Miller and Valasek have spent years investigating car computer security, sometimes funded by the US Defense Advanced Research Projects Agency. Last year at Black Hat, the two showed off similar hacks, and they have now persuaded politicians of the need for action. On Tuesday, Senators Edward Markey (D-MA) and Richard Blumenthal (D-CT) introduced the Security and Privacy in Your Car (SPY Car) Act, which will require motor manufacturers to get their acts together on car operating systems. “Drivers shouldn’t have to choose between being connected and being protected,” said Senator Markey. There’s an updates available for it, so yah please don’t pass it up – it’s kinda important. It’s only available to install via a USB stick or an authorised mechanic though, no push OTA updates like BMW did for the door-lock flaw earlier this year so it’s likely a lot of cars are going to remain vulnerable. The software update is available here: uConnect Software Update Site. So if you have one of these cars, ya – please update and secondly..perhaps reconsider your choice of vehicles. 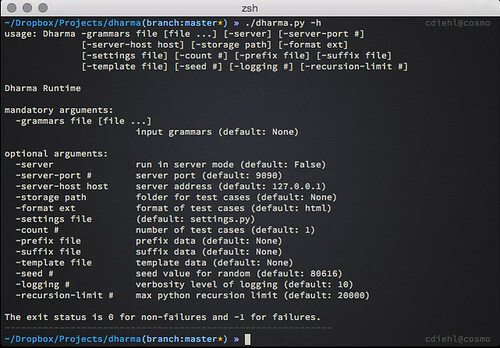 Dharma is a tool used to create test cases for fuzzing of structured text inputs, such as markup and script. It takes a custom high-level grammar format as input, and produces random well-formed test cases as output – it can be used as a grammar fuzzing tool. API programming is complex and subtle programming mistakes in new code can introduce annoying crashes and even serious security vulnerabilities that can be triggered by malformed input which can lead to headaches for the user and security exposure. WebAPIs start life as a specification in the form of an Interface Description Language, or IDL. Since this is essentially a grammar, a grammar-based fuzzer becomes a valuable tool in finding security issues in new WebAPIs because it ensures that expected semantics are followed most of the time, while still exploring enough undefined behaviour to produce interesting results. Apart from the original features listed above the guys from Mozilla dragged Dharma out of 2012 and gave it a good working over. They improved the way it parses grammars and optimized the speed of parsing and the generating of fuzzed output, added new grammar features to the grammar specification, added support for serving testcases over a WebSocket server, and made it Python 3 ready. Generate a single test case with multiple grammars. For those not familiar before we get to the Telegram DDoS attack, Telegram is an instant messaging system focusing on privacy and multi-platform availability. It was launched by the founders of VK, the largest social network in Russia and is run as an independent non-profit company in Germany. The client code is open-source and audited and various implementations can be found by various individuals based on the API. Just a few days ago, users in South East Asia were having difficulty accessing the service and Telegram announced they were suffering a huge DDoS attack. 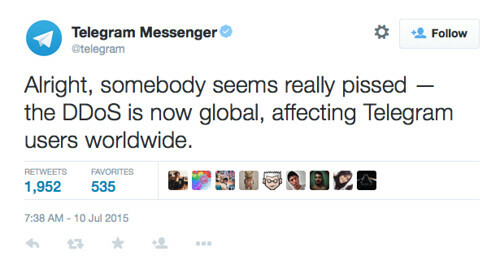 Popular messaging platform Telegram has been hit with a 200Gbps distributed denial of service (DDoS) attack. The Tsunami TCP SYN flood kicked off on Friday and hurt users in Asia, Australia, and Oceania, knocking out the service for some five percent of the company’s 60 million active users it has gained in 18 months. It is a new form of DDoS attack discovered October by Radware security folk who say it is different from regular SYN floods in that it transmits large 100 byte packet sizes about double the regular 40 to 60 byte size. That Radware says defeats many defense algorithms and quickly consumes bandwidth making even a modest attack clock some four to five gigabits per second. It seems to be a slight variation of the regular SYN flood with a larger packet size that quickly consumes network resources. With a 100,000 nodes involved the attack generating over 200GBps of bandwidth – it’s a fairly substantial attack. The garbage traffic came from about a hundred thousand infected servers, most noticeably, in LeaseWeb B.V., Hetzner Online AG, PlusServer AG, NFOrce Entertainment BV, Amazon and Comcast networks,” Telegram says. “That said, the attack was distributed evenly across thousands of hosts and none contributed more than five percent of the total volume … by now we know that the attack is being coordinated from East Asia. The company says it did not want to discuss its mitigation measures in the event that it could give pointers to attackers unknown. The attack follows a bizarre smaller DDoS that followed a move by the company to introduce free custom stickers over the service. It seems like no clear reason why Telegram is the target of this attack, some conspiracy theories claim it to be because of the free custom stickers – which other similar messaging apps make money from. That seems a little far fetched though, we’ll keep an eye out and see if any more information emerges. 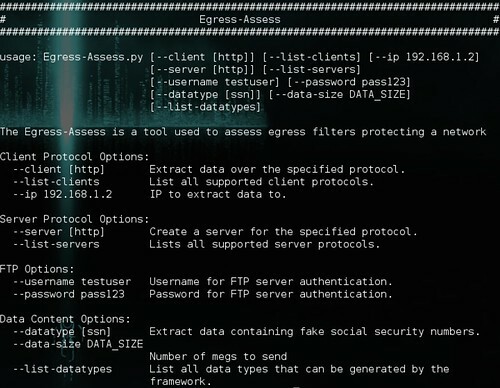 Egress-Assess is a tool used to test network egress data detection capabilities, it works over FTP, HTTP and HTTPS. It can generate various data-types to test detection, credit card details, social security numbers (SSN) and name/address combos. This tool is designed to be an easy way to test exfiltrating data from the network you are currently plugged into. Used for red or blue teams that want to test network boundary egress detection capabilities. Typical use case for Egress-Assess is to copy this tool in two locations. One location will act as the server, the other will act as the client. Also, you can setup Egress-Assess to act as a web server by running….